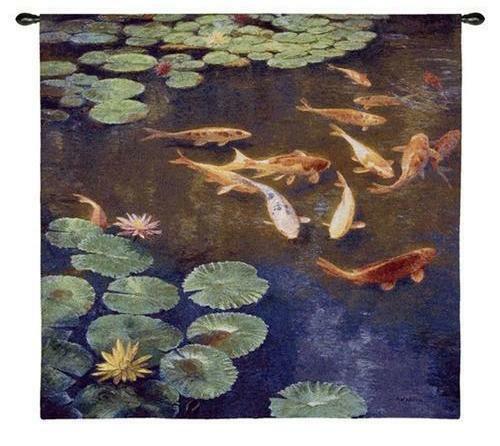 "Inclinations Tapestry Wall Hanging" Acclaimed artist Curt Walters astounds with a languid look into the home of a koi family. The rich aquatic hues and tropical colors of the koi are utterly inspiring. The high quality tapestry is woven on Jacquard looms. Includes rod pocket and weighted bottom for easy hanging. Cotton blend. Spot clean only. Measures 45" wide x 44" long. Note: Rod not included with this item. May be purchased separately in my store. Request adjusted invoice for combined shipping when ordering a rod or tassels with this item. PLEASE NOTE: Shipping ONLY within the continental U.S. Hawaii, Alaska, and Puerto Rico residents please contact seller for shipping quote before ordering.